As I thought a couple weeks ago, the lockout bunched everyone up this year. There just weren’t enough games for teams to separate at the bottom. Only the Bobcats, Wizards, Timberwolves, Trail Blazers, and Bucks clinched their spots before the season ended. This doesn’t mean that teams weren’t tanking (see my post on the Cavs yesterday), but I can’t really test for tanking in a foolproof way. And, comparing pre/post clinch winning percentage doesn’t identify all tankers, since some teams may make personnel decisions that are irreversible (Exhibit A: the Warriors) and others just get so used to losing or are so terrible that motivation fades (Exhibit B: the Bobcats). The one team that looks like a tank show for sure is the Wizards, who essentially clinched the second lottery spot a week ago, and rattled off five wins to finish the season. While the Wiz were playing all their stars down the stretch (since they had no reason left to lose), their buddies at the bottom (Cavs, Timberwolves, Warriors) were sitting everyone down or trading them. The big outlier of course is the Hornets, who, due to their league ownership, kept Eric Gordon alive and played GREAT down the stretch. At least it only cost them one spot in the end (they finished tied for third), and Hornets fans can be optimistic about next year with Gordon. Now that we’re done with all that tanking, let’s get on to the NBA’s second season, where all the best players get to play, all the stadiums are full, and all the teams are above average. Cavaliers, what have you done? Yesterday, based on my past research with my buddy Chris, I predicted that the Wizards would take it to the Cavaliers last night. The Wizards were already locked into the 2nd lottery position, while the Cavs could still move up or down. Well, I was right. The Cavs looked good to start the game and then slowly faded away. There’s a lot to decide in the NBA draft lottery still, with six teams bunched between 21 and 23 wins. The most unfortunate of these teams is the Hornets, who have won 62% of their games since they were eliminated from the playoffs on March 31st. They’ve beaten such quality teams as the Nuggets, Rockets, Jazz, and Grizzlies in that stretch — pretty much unheard of for a team in their position — and risen from possibly 2nd in the lottery to a potential tie for 5th (meaning they get the average lottery odds between 5th and 6th places). I’m sure this is due to league ownership (which forced the Hornets to bring back Eric Gordon). It’s a great “natural experiment,” actually, that provides further evidence of tanking by all other (individually owned) teams. A few teams have clinched their lottery spots already: the Bobcats, Wizards, Timberwolves, and Trail Blazers. My research with my buddy Chris shows that these teams should pick it up now that there’s no reason to tank. Stay tuned for the final Tank Watch in a couple days. There’s a good test match up tonight between the Wiz and the Cavaliers — I expect the Wizards to take it to them. We’ll see if the clinched teams outperform the other playoff eliminated teams over the next two days. Last week, the tanking was going strong. Only the Hornets had played well among playoff eliminated teams. My guess is that league ownership made them bring back Eric Gordon, and it’s about to cost them a lottery position after they won again in the last few days. They helped boot the Rockets out of the playoffs and Gordon had another superb game. Tonight, we get a treat! The Bobcats travel to play Washington. 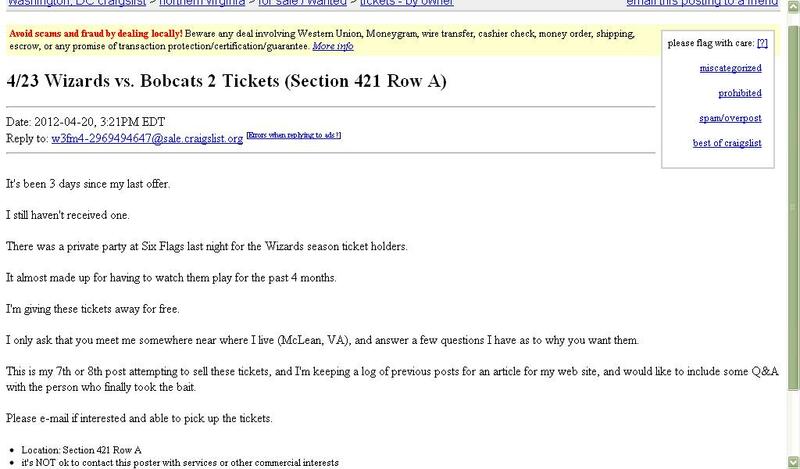 Below is an incredible craigslist post that my buddy Tony sent me about this game (click to enlarge). Apparently there were zero tickets listed on Stubhub around 4pm. ‘Tis the season for tanking! Last week, there were six teams eliminated from the playoffs. The Bobcats and Wizards had lost quite a lot already since then, though the Hornets looked surprisingly good. The Hornets continue to look good, but everyone else is bad bad bad, and the ranks of the eliminated have grown. The Bobcats locked in the worst record last night, but it’s hard to imagine them winning any games the rest of the way, so I’m not sure they can be accused of tanking. They are just a terrible team. Who tanks in the NBA? Tanking: intentionally losing in order to improve draft position. After my PhD buddy Chris and I circulated our findings that NBA teams tank a lot, we’ve been asked a few times, “Which teams are tanking?” Today I offer a quick look at teams that have likely tanked. First, a refresher: we measure tanking by comparing performance before and after playoff-eliminated teams “clinch” their lottery spot. In the last couple games of the season, many teams lock in their spot, so they no longer have an incentive to lose. Those games act as our control. The problem with doing it this way is that some tankers may keep trying to lose even after they clinch their spot. This could happen because teams shut down star players because of “injury” or just because teams develop a habit of losing.